It is now said that one in two people in Great Britain will be diagnosed with cancer during their lifetime. Half of us. A startling figure that refocuses efforts to address how and why people may engage in behaviours that could increase their risk of developing a form of the disease. In doing so, we need to better understand who is at risk in order to target public information, interventions, policies and services. We do not yet know all there is to know and our new study, conducted with the support of CRUK, set about to better understand the risks for young people. We found that young people who are not in education, employment or training (the so-called ‘NEET’ categorisation) may be increasing their risk of developing cancer by participating in a range of unhealthy behaviours, such as smoking and excessive alcohol consumption, that are related to cancer. It’s well-known that there are well-established links between such unhealthy behaviours and an increased risk of developing some cancers. Currently, the most common cancers in Europe, representing half of the overall burden of cancer, are breast, colorectal, prostate and lung cancer. As the World Health Organization (WHO) asserts, some of the risk of developing these cancers has been attributed to participation in unhealthy behaviours including smoking (lung), alcohol consumption (breast), low fruit and vegetable intake (lung, colorectal), physical inactivity (breast, colorectal, prostate) and excess body weight (colorectal). Unemployed people are more likely to participate in unhealthy behaviours and so the suggestion is that their risk of developing cancer may be greater than for those who are employed. Research has demonstrated that links between unemployment and cancer do exist. However, much of this research has tended to focus on unemployment in middle age, or was based on groups of individuals spanning a wide range of ages. There’s a real lack of evidence focusing primarily on unemployment in early adulthood as a risk factor for cancer, and there are mixed views on whether young unemployed people do actually have a greater tendency to participate in unhealthy behaviours when compared to young people who are employed or in education. This is what we set out to address. Using data from health surveys conducted in Scotland and England during 2010-2012, our study specifically focused on young people, and with the aim of determining whether young people who are NEET were more likely to participate in unhealthy behaviours and increase their cancer risk than their ‘non-NEET’ peers. Young people are defined as NEET if they are aged 16-24 years old and Not in Education, Employment or Training (NEET). In our data sample of 4,272 16-24 year olds, 715 (17%) were identified as NEET. The NEET label often tends to have negative connotations, but in actuality it brings together individuals from a wide range of backgrounds and circumstances. Simply put, there is no such thing as a NEET, that would be a stereotype. As well as including people in this category who have poor educational attainment, the grouping also includes those who stay at home to care for family, people who are long-term sick or disabled, university graduates seeking employment, as well as school-leavers taking a gap year before starting higher education. What’s often overlooked by a stereotype is why we might need to differentiate. We can better understand the lives of these young people when we note the difference between those who are, and those who are not, actively seeking employment, education or training. The UK Government does this by further classifying NEETs as unemployed or economically inactive. NEETs are defined as unemployed if they have been actively seeking work within the last four weeks and would be available to start work within the next two weeks; otherwise, NEETs are defined as economically inactive if they have not been seeking work within the last four weeks and/or would not be able to start work within the next two weeks. Of the 715 NEETs in our study, 371 (52%) were further defined as unemployed and 342 (48%) as economically inactive. For us, this differentiation was key. Could there be differences between the health behaviours of unemployed young people, and those of economically inactive young people? Who are ‘NEETs’ and are they more unhealthy than non-NEETs? In our study, first we compared health behaviours of all NEETs, regardless of whether they were unemployed or economically inactive, with non-NEETs and then, secondly, we compared health behaviours of only the unemployed NEETs with non-NEETs (excluding those who are economically inactive). Despite the potential for variation in socioeconomic backgrounds of young people not in education, employment or training, those in our study tended to have poorer socioeconomic circumstances than their non-NEET peers. This included having no access to a car/van; having low, no or foreign educational qualifications; not owning their own home (either outright or with a mortgage); receiving means-tested benefits, and having lower total annual household income. We found that the young people not in education, employment or training were more likely to participate in some cancer-related health behaviours than their non-NEET peers. For example, compared to non-NEETs, they were significantly more likely to be current smokers, not participate in sport, and have an unhealthy BMI. This was the case regardless of whether NEETs were unemployed or economically inactive. 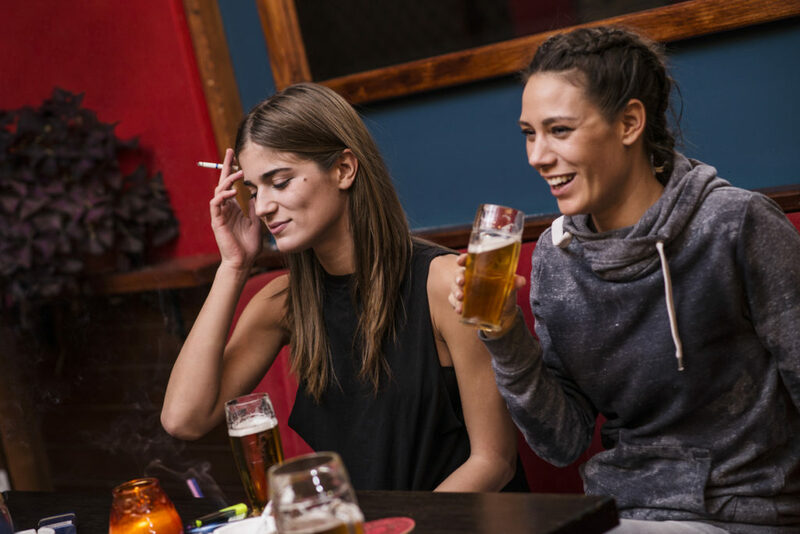 However, when we looked at heavy drinking – that is, according to the current guidelines, consuming more than 14 units of alcohol per week for females and more than 21 units for males – we found that the young people who were not in education, employment or training were significantly less likely to be heavy drinkers than their non-NEET peers. But this was only true when the whole group was compared. This changed when those who were economically inactive were not included in the second analysis – the likelihood of heavy drinking between unemployed young people and their non-NEET peers was not significantly different. Something appears to be happening in the lives of those who are economically inactive that affects their consumption differently to their unemployed peers. This highlights a potentially important new area of focus and, as is often the case, also knowing the limitations of your data. Early parenthood has been shown to moderate alcohol consumption. Could this perhaps be a factor at play? For example, if the likelihood of having children is assumed to be greater amongst young people who are economically inactive rather than those who are unemployed, this could, in theory, explain the finding of lower alcohol consumption among economically inactive young people. But whether a person had children was one characteristic that we had no information on in our data sample. What does this mean for our young people? I believe that being able to show that young people who were not in education, employment or training were at an increased risk of undertaking cancer-related behaviours adds useful insight, of real value to how we look to address harms to health. It means that targeting attempts to reduce unhealthy behaviours amongst these young people may contribute to a reduction in the incidence of cancer and healthier outcomes. Moreover, the analysis showed that the factors that affect the health and wellbeing of all young people are not all the same, nor do they have the same impact, and in addressing the challenge of poor health and risks to future health, we would all do well to remember this.